Neutral tones and subtle pattern define this mid-century Scandinavian wallpaper. Large, airy blossoms of Queen Anne’s lace float like fluffy fireworks on a light gray ground. The larger blooms are composed of hundreds of tiny white flowers supported by a framework of dark gray stems. As in nature, a single bright red flower marks the center of each stem. One tradition holds that the flower received its name when Queen Anne of England pricked her finger during an embroidery competition, a drop of blood falling upon the white lace. The panel is machine-printed, and was produced by the Swedish manufacturer, Godeborgs Tapetfabrik, between 1948 and 1955. As Scandinavian textile design gained prominence, Nordic wallpaper manufacturers also became popular in international markets. The region became known for producing paper with unobtrusive yet modern patterns. Grayscale designs like Queen Anne’s Lace were in high demand, as they provided a versatile backdrop against which more ostentatious furnishings and artwork could be displayed. The Danish designer of Queen Anne’s Lace, Bent Karlby, was a trained architect, and produced a number of wallpaper patterns drawing upon traditional Scandinavian folk art depictions of plant-life. These nature-inspired patterns found particular favor with patrons in the United States, and were imported with great frequency during the 1950s. 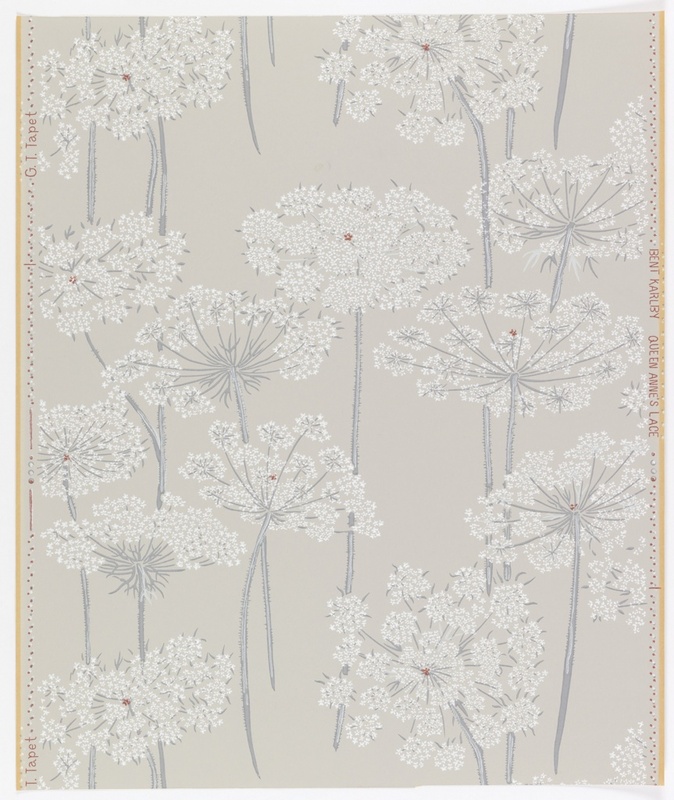 Queen Anne’s lace is an especially appropriate subject for a wallpaper meant for private dwellings, as the pleasant wildflower is a traditional symbol of sanctuary.